New students quickly learn that they’re also part of Murfreesboro, whose people reach out to students and make them feel at home. And many students reciprocate by engaging in the civic life of the city. Living in Murfreesboro means you’re in the middle of it all—at the geographic center of the state. (There’s even a monument to prove it.) The city is within comfortable driving distance of other cities across Tennessee and neighboring states. Murfreesboro is a growing city of more than 130,000 that ranks as the fastest-growing large city in Tennessee and in the top 15 in the U.S. The ‘Boro offers a vibrant quality of life that led Rolling Stone magazine to call it “a surprisingly hip town.” Murfreesboro is in Rutherford County, the fastest growing county in the state. Its booming economy ranked first in the nation just a few years ago. 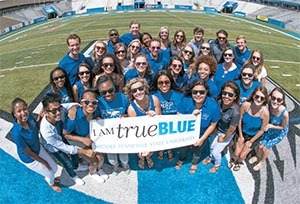 Citing its “small-town charm,” impressive growth, and a university in MTSU that is beloved by its alumni and supporters, Southern Living magazine also recently named Murfreesboro one of the “South’s Best College Towns.” Murfreesboro was among 21 towns described as “some true hidden gems of the South.” The magazine highlighted cities with 350,000 people or fewer where “the college is a driving force in the character of the town.” Knoxville was the only other Tennessee town listed. Referencing MTSU’s renowned music business and recording program, the magazine notes that music is also king in Murfreesboro, located just a half hour from musical industry hub Nashville. The ‘Boro is home to live music on campus, at venues, in parks, at restaurants, and at events like the Main Street JazzFest, put on by the MTSU School of Music, Southern Living points out. Students can find plenty of flavorful food around town, from Mexican to Greek cuisine, barbecue to Southern Cajun, and even Tolkien-inspired fare at the Green Dragon Public House. MTSU is located about 30 miles from Nashville, ranked in the 13 “hottest American cities” by Business Insider and in the top 10 for growth and prosperity by Brookings Institute. About 40 College of Media and Entertainment students worked at the internationally acclaimed Bonnaroo Music and Arts Festival―most for course credit―through a unique partnership. Some used MTSU’s $1.7 million Mobile Production Lab to recorcd and film concerts, while others file multimedia reports for news outlets. MTSU boasts the Center for Chinese Culture and Music, the only center of its kind in North America. The center, which includes a gallery of Chinese musical instruments, also promotes language, business, and trade. The 3,200-square-foot center on Bell Street is part of MTSU’s Confucius Institute.